There are many reasons to recycle. Mid-City Scrap Iron & Salvage provides businesses in the Southern New England area with a responsible, cost-effective and compliant solution for their scrap metal. The recycling services we provide to our customers work to conserve natural resources, reduce CO2 emissions and mitigate environmental risks within the communities we serve. Recycling should be an important part of every ethical business. Reduce Your Carbon Footprint – Recycling helps to reduce the burden on area landfills, diverting as much as 150 million tons of materials each year. It also helps to reduce greenhouse gas emissions, cutting down on air pollution by as much as 80%, water pollution by 76% and water usage by up to 40%. 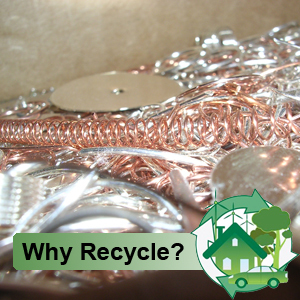 Recycling also conserves energy because it requires less energy to process and manufacture products from recycled materials. For example, products created from recycled aluminum use 95% less energy than products that are created from raw materials. Conserve Natural Resources – Recycling helps to conserve raw materials and natural resources. Just one ton of recycled steel helps to conserve as much as 120 pounds of limestone, 1400 pounds of coal and 2500 pounds of iron ore. Our goal is to increase the amount of materials we recycle each year for the overall good of the planet and as a means of supporting sustainable production and consumption within the state of Massachusetts. Revenue is a Strong Motivator – Recycling is also a great stream of revenue for businesses, making it a financially sound practice. Mid-City Scrap works to help our clients turn scrap metal and materials into revenue and reduce overall waste disposal costs. We can also provide consultation services that will help businesses set environmental goals, providing the tools and services necessary to comply with new “green” legislation. Mid-City Scrap Iron & Salvage’s recycling services help businesses to create environmentally-friendly products. These products help to stimulate the development of new “green” technology. In the big scheme of things, the process of recycling has become a key ingredient not only in the protection of the environment, but also within US and global trade markets as well.